The newly launched Indian superbike Hero Karizma ZMR has got everything new in it. 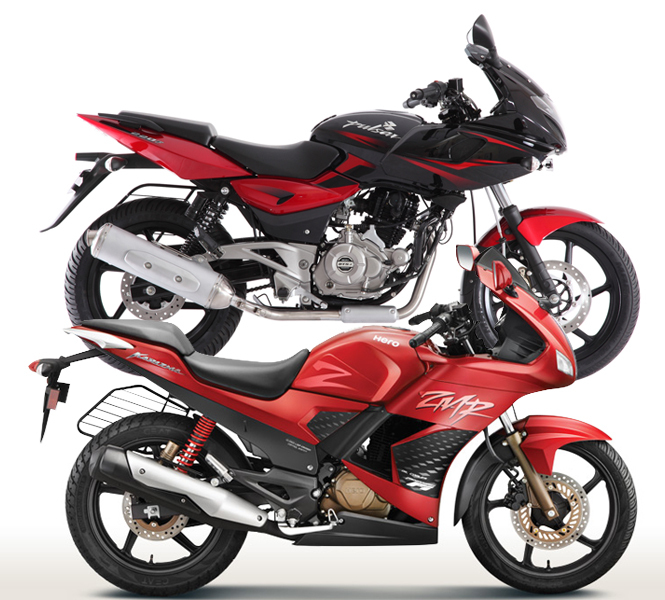 The Hero Karizma was firstly introduced in 2003, which was later accompanied with the ZMR variant in 2009. This full fared jumbo machine has always stretched a huge enthusiastic public towards itself as it is one of those high on performance and low on maintenance bikes available and made in India. Shining out of the crowd and making people turn towards it; these are the things which Karizma knows very well. On the other hand, another Indian manufacturer has its long term contender i.e. Bajaj Pulsar 220. This bike has also been long in the tooth since 2003. This is one of the most selling country made superbikes, which is liked very much by youngsters. The basic design of this bike is similar to the one found in other bikes of Pulsar series except the Pulsar 135 LS. With frequent updates to this bike, the final product which we have today is a combination of 3-4 colors merged in the shade of black base. Both the bikes are perfect match as a rival and here is a short review about the same. Hero Karizma ZMR is still the same full fared motorbike. It looks quite innocent from front when compared to the earlier version which was a much aggressive looker. The visor has grown big, actually very big and covers a good amount of obverse. Headlights are placed one above another. This headlight pattern is somehow, seems to be borrowed from the Pulsar 220 as it also having the similar assembly. Bajaj has not made faring upto the engine and this makes it a bit naked. As far as my personal opinion is considered, the pulsar looks much balanced here. Hero has missed the projector headlight unit which could have made them grab one point extra. The instrument cluster, dashboard and other equipments of both these bikes are having rich looks. However, Karizma has a bigger and bold meter console which looks exactly same as the last version of the bike. Additional feature which has been added to this bike is the side stand reminder. Pulsar, on the other hand has the same meter console which was there in its initial days. This makes its look dull and out of the fashion, but Pulsar fans do not care about it, as they will hardly be checking their speed. Both the bikes offer Clip on handlebars which is the latest trend in the motorbike industry, and comfortable too. The Karizma ZMR has received a good amount of seating space with a full length seat which has been raised a bit. Pulsar offers sportiness more than comfort. It has split seats and raised rear seat. The braking component in both the bikes is disc brakes for front and rear wheels. However, the introduction of CBS or ABS would be a good idea, but ultimately it will increase the prices of them drastically. More or less, both the bikes are good at their level of safety. Hero Karizma ZMR boasts an Air cooled, 4- stroke, Fuel Injected single cylinder OHC engine which manages to burnout 20BHP of power @ 8000RPM. This power is lower to that of Pulsar which has a 220 cc engine and makes a huge 1 BHP extra i.e. 21.05 BHP @ 8500RPM. This makes pulsar to churn out a whooping torque of 19.12Nm @ 7000 RPM which is at a lower side as Karizma is having 19.7 N m @ 6500 RPM. The differences are not much but it seems to be crossing the marks. The front wheel of the Karizma ZMR is supported by Telescopic Hydraulic Shock Absorbers while the rear has Swing Arm with 5 Step Adjustable GRS System. Pulsar houses Telescopic, with anti-friction bush front forks, while rear has been supported with 5 way adjustable, Nitrox shock absorber. This mean the front and rear suspensions are not new things to these bikes. Both of these companies haven’t thought of Monoshock suspension which is available in a much smaller Yamaha FZ series. Moreover, Bajaj also has planted this system in Pulsar 200NS. Hero might have decided to not to introduce mono suspension in any of its bikes as the new Hero Xtreme Sports has also been kept at a distance from it. Though, the last season look of Hero Karizma ZMR was a better eye-catching object. The bikes here are different to each other in many terms. As Bajaj has always been the first choice of all age groups because of the raw power it delivers. But fact where Pulsar lags behind is the refinement. Bajaj bikes are down at the refinement which they have. The Honda sourced engines in Hero bikes produces tuned yet refined performance which makes the ride more enjoyable at a lower power. 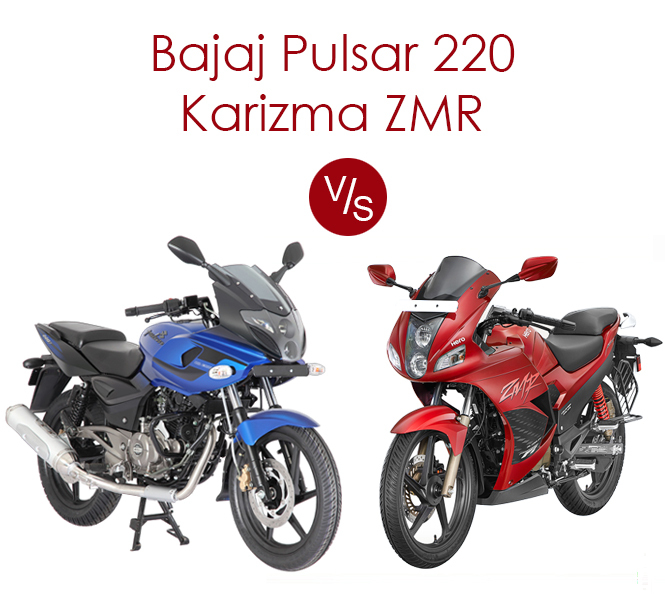 There are rumours that Pulsar is going to get a complete makeover on Pulsar 200NS pattern. Hero lovers can go with the new ZMR if the looks are not an issue, otherwise, waiting for an updated Pulsar would be worth. When new Karizma ZMR 2015 launch. Having owned both the bikes, the ZMR suspension is a serious threat to stability at high speeds. Though the ZMR has better brakes than the P220, the soft suspension on the ZMR causes the bike to unsettle when braking at high speeds. The P220 needs better seats and better rear shocks to completely triumph over the ZMR.